Pope Francis has been speaking his mind again. This time in front of small children, taking aim at the power of the arms industry. Please keep your children away from the Pope, so he can not misguide them. The head of the Catholic Church lambasted the weapons trade as “the industry of death” in response to a question from a child about war. 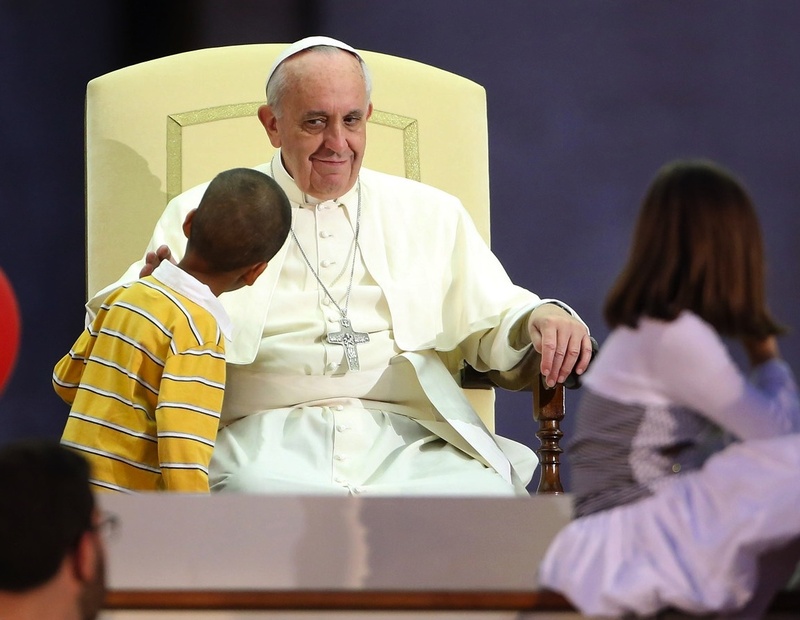 The Pope told the children that some people make money by producing and selling weapons. The USD 400 billion global arms industry has seen trade soften slightly in recent years, though sales in Russia and Saudi Arabia are on the rise. American companies account for more than half the world’s arms trade. The U.K. is the next largest weapons producer, according to the Stockholm International Peace Research Institute, and Russia is another major global seller. Russia has begun investing heavily to upgrade its capabilities. Local defense companies boosted sales by more than 20 per cent last year, driven by demand from the country’s military. The Pope him self was gifted the Vatican statehood from a producer, seller and user of arms. Fascist leader Benito Mussolini. So if there is someone who needs to take a deep look in the mirror, it is the Pope him self. The issue of the weapons industry is not a black and white issue. The first producer of a weapon, was likely the fiesta man Adam. He needed a weapons to be able to kill an animal and get him self some food. God never told Gideon not to fight with weapons. He told Gideon to fight the war with so few men, that they would not take the credit for the victory. But leave the victory to God alone. There would not have been a nation of Israel, if King David was not permitted to make and use weapons. Jesus the Messiah told his disciples to carry two swords. Someone must have produced them, and sold them to the students of the Messiah. Most likely the swords was carried by the followers of God of Israel, for their own protection. There is nothing wrong by the concept of a knife. But a knife can be used to slice bread, and it can be used to kill a small child. Likewise the producers of weapons, can be tempted to make profits from unjust wars and violent oppressions. The Pope is again off track, and are not able to discern right from wrong. If he was representing God of the Bible, he should at least give the audiences a biblical message. What about quoting from the Bible, or giving Biblical references related to use of weapons? Since the Pope do not represent God the almighty, his speeches will be full of human wisdom and errors. Do not put your trust in the Pope, but in Jesus the Messiah, alone. Francis wasn’t the pope when Mussolini was around,and make sure when holding up mirrors you have plenty of windex too!!! And he shall judge between the nations and reprove many peoples, and they shall beat their swords into plowshares and their spears into pruning hooks; nation shall not lift the sword against nation, neither shall they learn war anymore. דוְשָׁפַט בֵּין הַגּוֹיִם וְהוֹכִיחַ לְעַמִּים רַבִּים וְכִתְּתוּ חַרְבוֹתָם לְאִתִּים וַחֲנִיתוֹתֵיהֶם לְמַזְמֵרוֹת לֹא יִשָּׂא גוֹי אֶל גּוֹי חֶרֶב וְלֹא יִלְמְדוּ עוֹד מִלְחָמָה: How long, O Lord! Surley the Roman Catholic religion is a death cult. It is extremely dangerous, because it claims to be rue Christianity. It has a “christ’ in its midts, that is not Jesus of the Bible. Those who follow this copy-cat walks right towards the broad gates of destruction. Amen my Sister! and right before He comes to get us, the 1st angel (Rev 14) calls all Christians back to proper worship of the Creator! Sabbath knowledge will circle the world and all will have their chance to honor His Seal or reject it. there will be, we believe, a reinforcement of the sunday laws (blue laws) that echo the 3 offenses of the Holy Covenant in Daniel 11:29,30,32 (3 times, just like at creation! Gen 2:2-3). i believe the first was in 1961 (McGowan v. Maryland). the next will be a reinforcement. the last will have the penalty of death. just like the other 2 trials of Daniel (Ch 2-3 and 6!). interesting times we are living in my Sister! i pray Gods blessings for you and your family as you continue to be an angel of Revelation 14! it is so creepy seeing this sinfilled satanist next to Gods precious children! amazingly revealing photos you post here Mr Ivar, thank you!